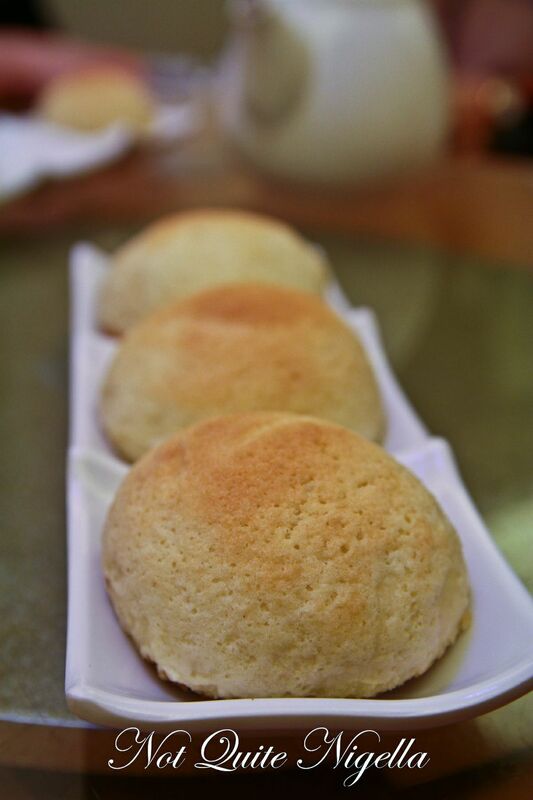 Happiness is a Tim Ho Wan barbecued pork bun. Dearest Readers, I think I may have found the definition or at least the gateway to happiness. 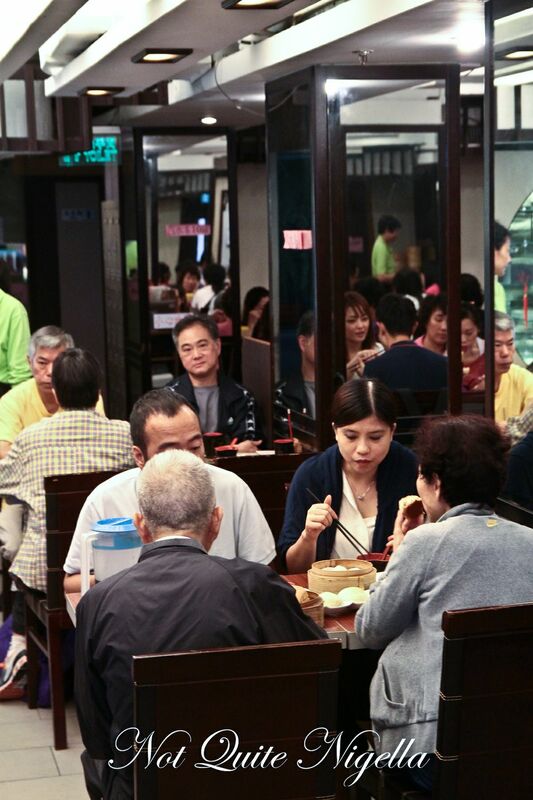 As I sat in at the table at Tim Ho Wan, the legendary dim sum specialist and the cheapest Michelin starred restaurant in the world, I looked around me at my fellow diners who had just been given a warm barbecue pork bun. Mr NQN had devoured his in two bites flat, Luke was chewing his with a profound look of happiness and Miryana just said "wow." 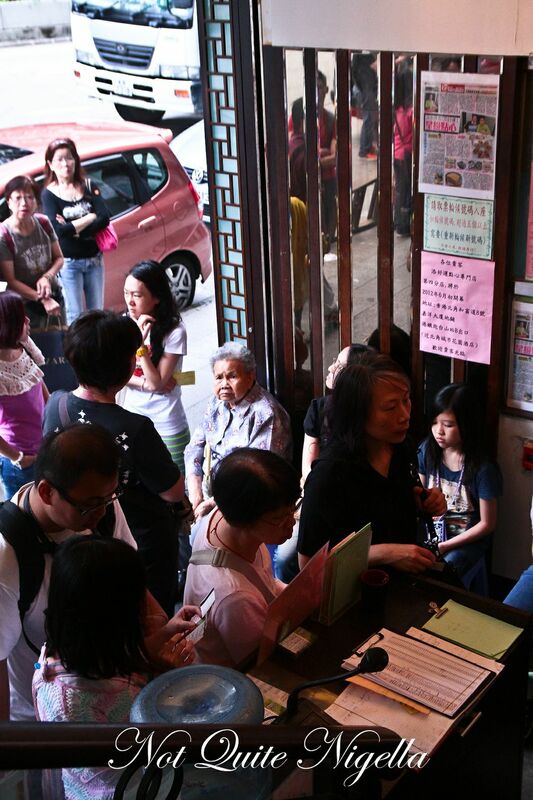 Tim Ho Wan, meaning "to add good luck" is so popular that queues are guaranteed. The first branch in Mong Kok seats only 19 people so the queues for this delicious and oh so reasonably priced yum cha are understandable. We are dining at the second branch where chef and owner Mak Kwai Pui (known as Pui or brother Pui) dishes out between 1,000-2,000 barbecued pork buns a day in a place that seats 150 people. 1,900 diners pass through its doors a day. So with a second location this large surely that means less queues? Nope, there's still the queue. But a little hint: you can book a VIP table upstairs if you have a minimum spend of $1000HKD ($123AU/$128USD) total for the whole table and 2 day's notice is required. The lines that stretch out onto the street are full of eager diners. There is a black Mercedes with an elderly grandmother and grandfather sitting in it. The family brings them cups of water and when their table is ready, they emerge from the car and make their way into the restaurant. 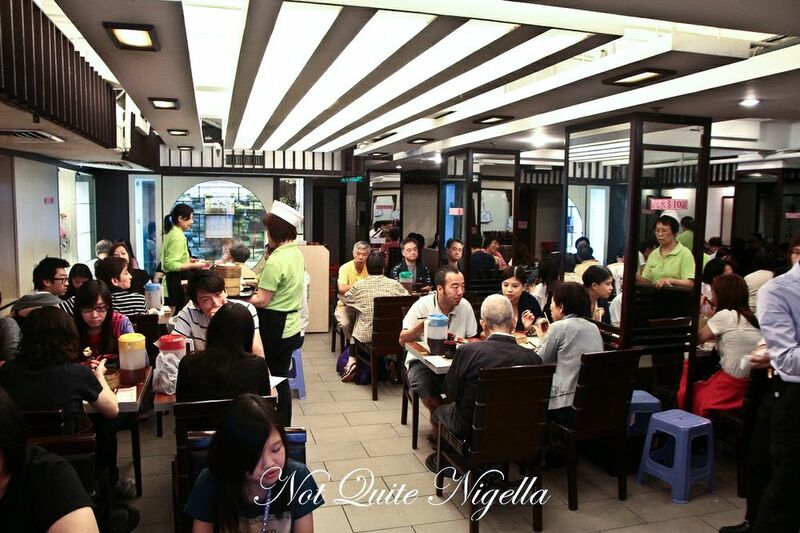 Inside the restaurant, it is modest and not flashy at all. The VIP rooms upstairs are simple with large tables and lazy susans. A bucket to the side catches drips and the lighting is flourescent but this deters no-one. 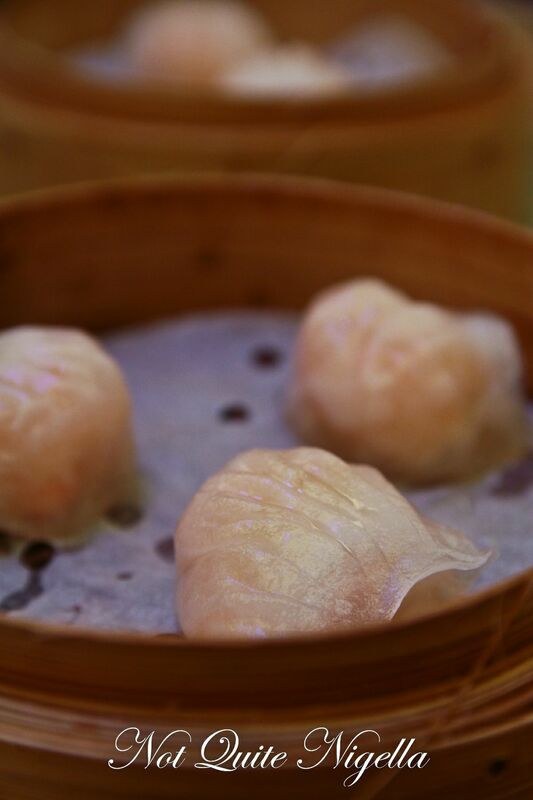 As Chef Pui sits down to eat with us, the dumplings come thick and fast. Everything is cooked to order, nothing is pre steamed or pre cooked. 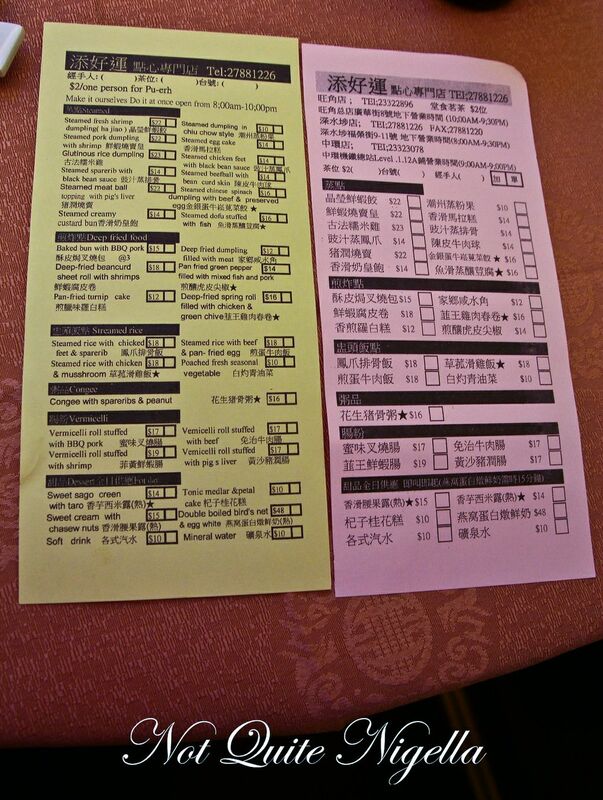 Ordering is done with a yellow form in English or a pink form in Chinese. And when you see the prices you may be as shocked as we were (and then we subsequently begged him to open in Sydney). Chef Pui doesn't speak English and I don't speak Cantonese so it is up to our wonderful guide Rainbow Wong to translate for us. 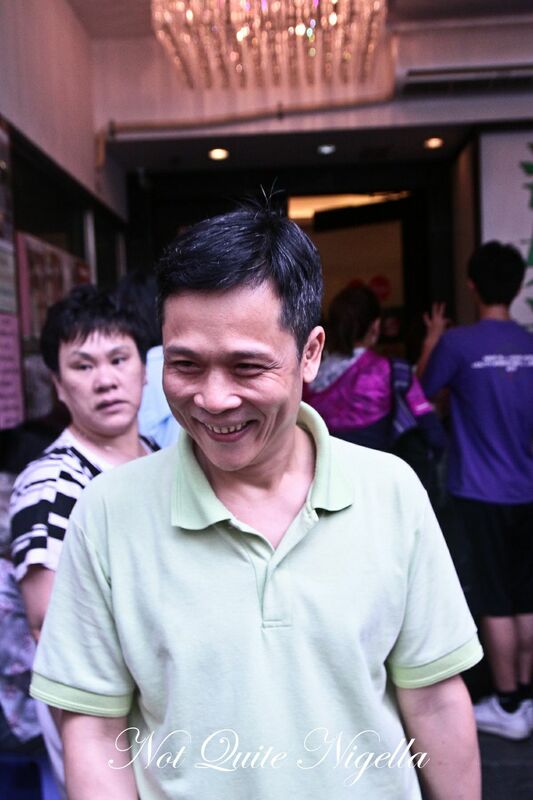 He was the former dim sum chef at The Four Seasons and he has been making dumplings for 30 years now (he is 50 years old this year). He first started cooking at age 15 and says that he considered this idea as chefs talents and abilities can wane as they grow older so he wanted to be an owner of a business in order to prepare for an early retirement. He has two children, one eight and one fifteen and neither show a love of cooking and he tells us that even if they did he wouldn't let them. He comes from a restaurant family with his father and uncle both working in the industry. Our attention is diverted by the food. The etiquette is to use the black chopsticks on the table to serve yourself; you then use the chopsticks next to you to eat. We ask Chef Pui about sauces and he recommends using the thicker sauces for deep fried food and the chilli oil for steamed dumplings. The menu features 27 savoury items and 4 sweet choices. 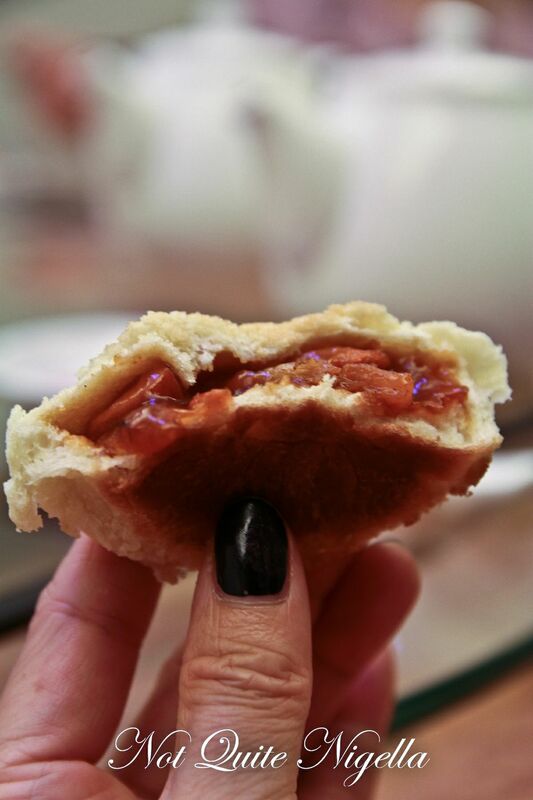 We each take a bite of the barbecued pork bun and it is a revelation. 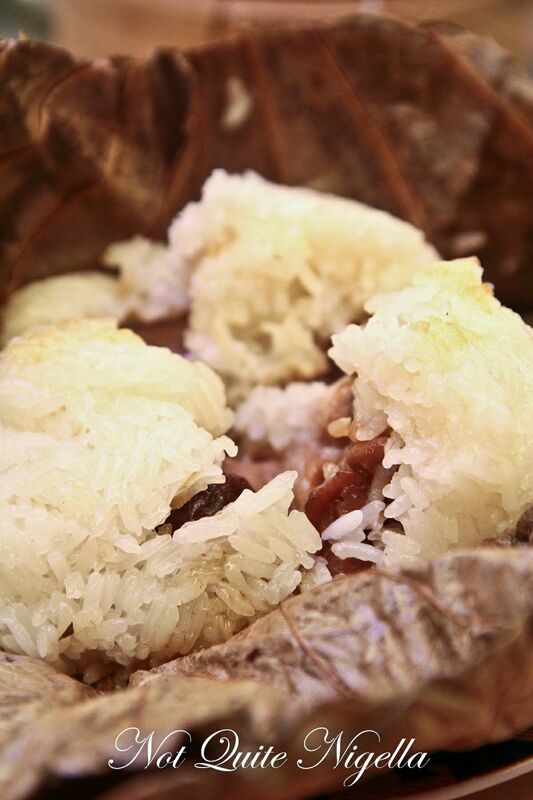 Unlike any other pork bun the topping is sweet and lightly crunchy and sinking your teeth into the bun each time yields a light, airy bread pocket stuffed full of thick, rich char sui generous with the thick, almost jellied sauce. I stopped after two bites and took much smaller bites not wanting the bun to end. 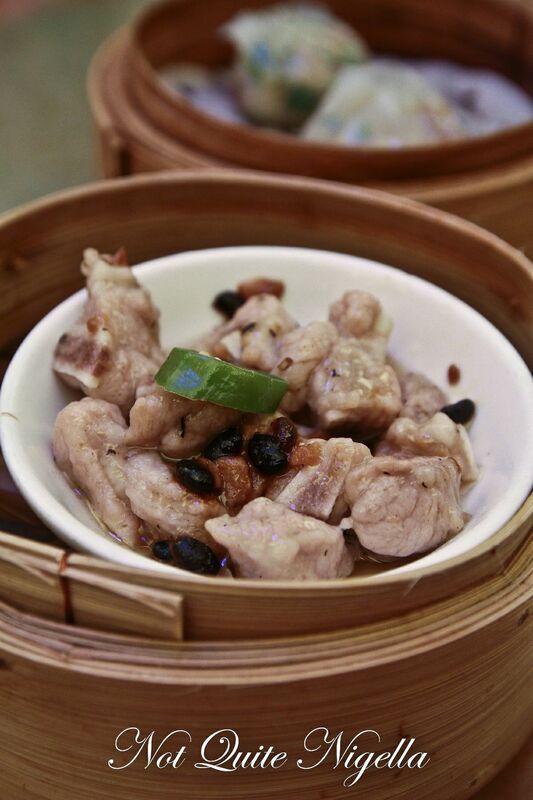 The topping is sweet like a pineapple bun topping and is made with eggs, sugar and butter, the fitting is replete with rich sauce and barbecued pork and the ratio of bread to filling is absolutely spot on which makes them utterly irresistible. We were curious to see what the chiu chow dumplings were like. We do have a similar version but I must admit I'm not a huge fan of dumplings with peanuts as the peanuts can get soggy but perhaps owing to the fact that these were made only a few hours ago they are crunchy with peanuts, water chestnuts, chives and pork. 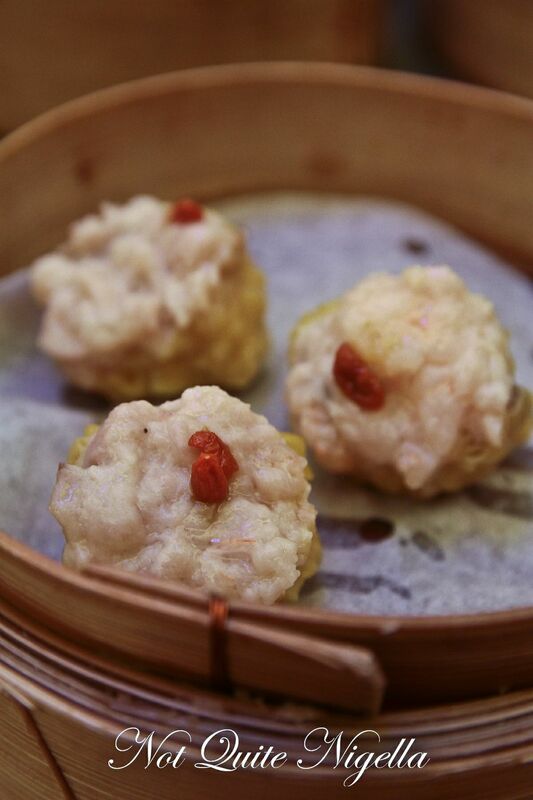 The siu mai is bouncy and fresh and packed full of juicy shrimp. I usually don't order them but these are a definite cut above the rest. 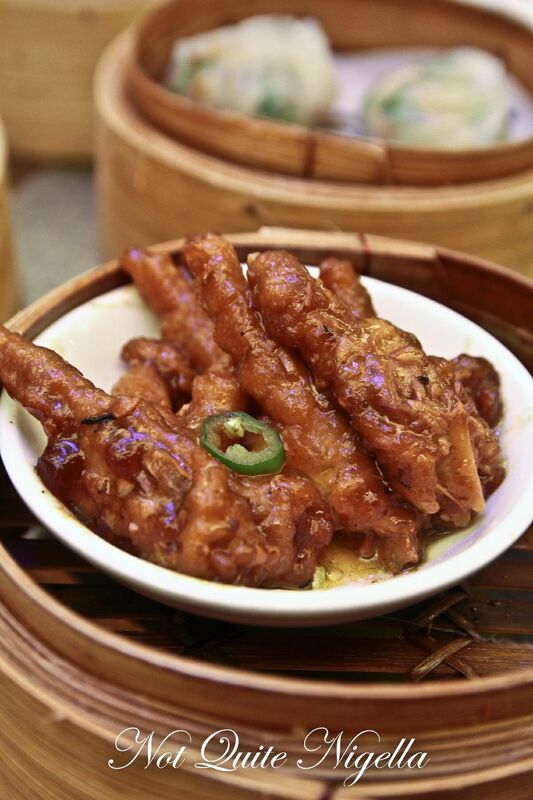 The chicken's feet are soft and gelatinous and coated with a thick, sweet black bean sauce. I'm a huge chicken feet lover but Mr NQN has never tried them (he finds them quite resistable) but we figure now is the time to try one and he likes them! Chef Pui tells us that in another branch, they aren't allowed to deep fry so he has come up with a way around this by using abalone sauce and cooking them for a long time to achieve the desired result. This is another dish I don't often order but when I try a morsel of the pork spare ribs with black bean sauce what strikes me again and again is how fresh everything tastes. These practically bounce with juiciness, texture and flavour. 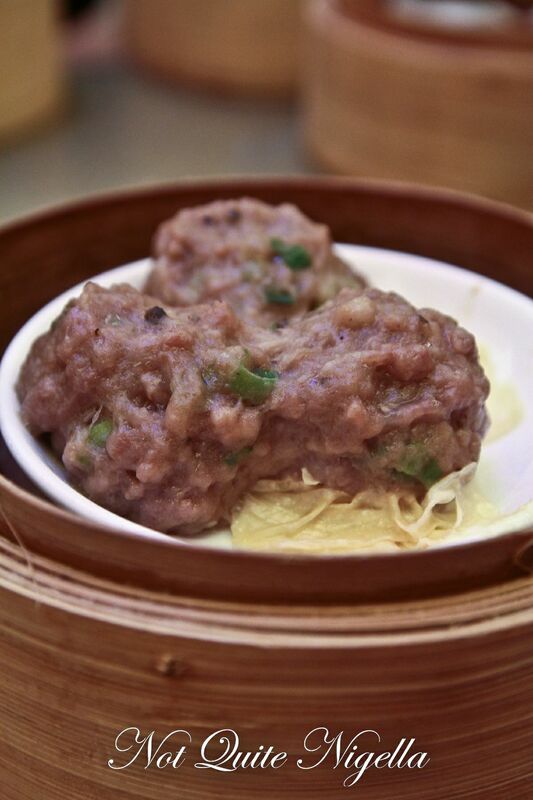 The tender, juicy steamed beef balls were given a special touch by adding in lemongrass and orange rind to lift the flavour (I almost wrote "lift the balls" there! ;) ). Chef Pui tells us that it is important that they don't over chop the meat as that can affect the texture. Mr NQN and I are crazy over har gows prawn dumplings and these are perfection. The generously portioned shrimp are the perfect, fresh and springy texture and the skin is so thin yet there is not a bit of tearing at all. Chef Pui explains that the glutinous rice dumpling comes in such a large size and shaped (as opposed to the star shaped ones) because this can hold a larger amount of filling and sauce. Inside is Lup Cheong (Chinese sausage), chicken and shiitake mushrooms and true to what he says, the filling is so much better because there is more sauce which disperses into the sticky rice. 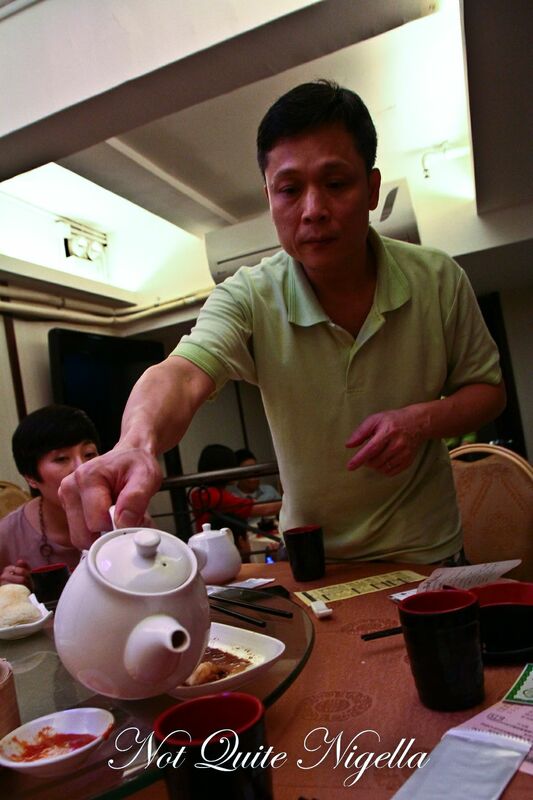 During the meal Chef Pui tops up our tea and serves us the dumplings. he occasionally ducks out for a phone call (his ring tone, set by his son, is that of bagpipes). 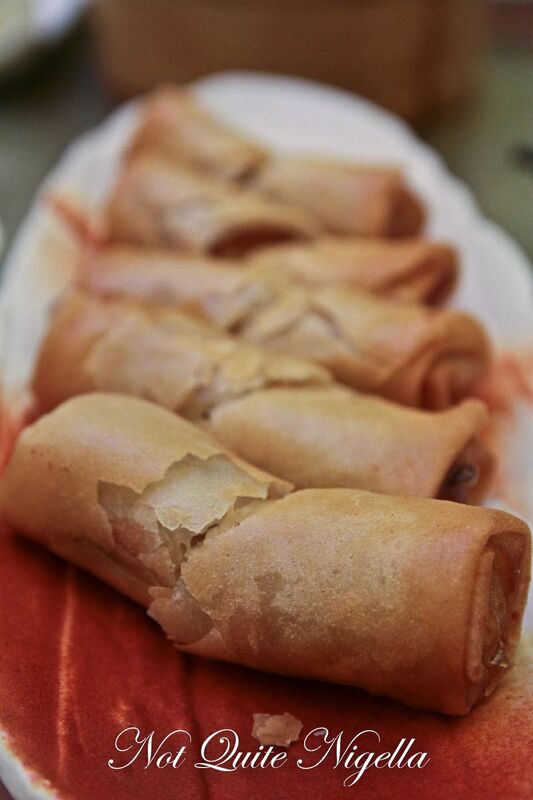 The spring rolls have a chicken and green chive filling which we thought might be different but it doesn't taste that different to other spring roll filling. These are fresh, crispy and crunchy. Apparently some people are divided by turnip cake for some reason. I had no idea about this as I love the stuff. 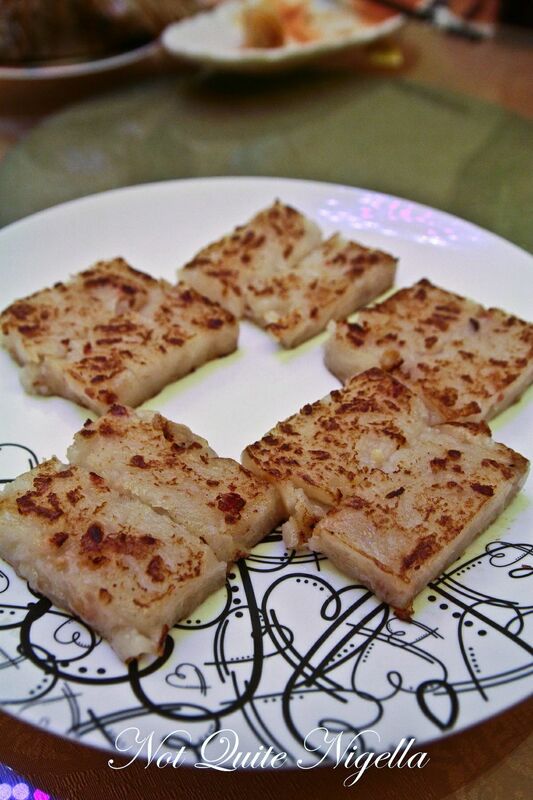 It's not a sweet cake but a savoury one with lup cheong, turnip and rice flour. It has a gelatinous texture and is pan fried so that the tops and bottoms are crispy. 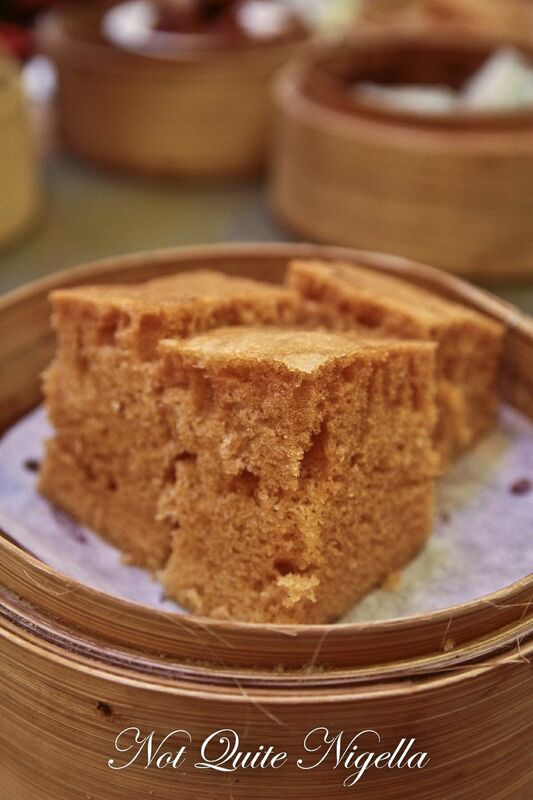 My mum makes a version of this cake using brown sugar but Chef Pui uses white sugar and caramelises it and makes a cake batter that is steamed. The resulting cake is a light spongey cake that has a lovely caramelised flavour to it. 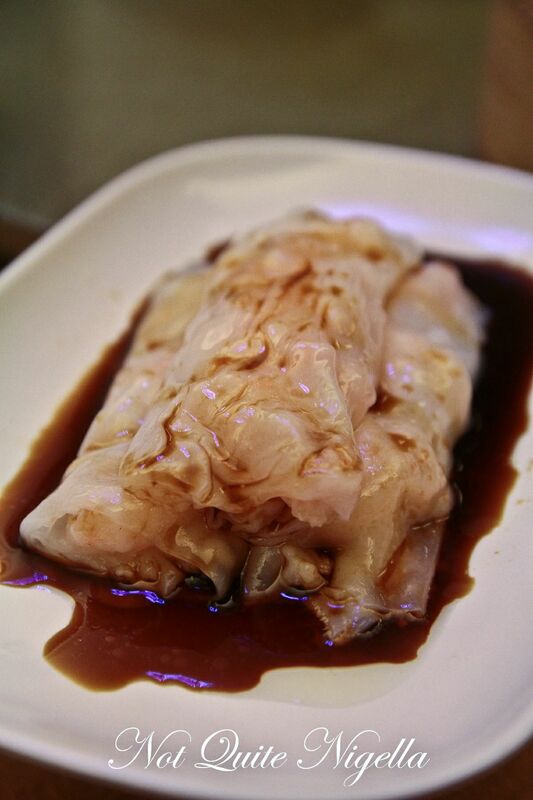 This is something that we always have to order at yum cha and it can either be fabulous or disappointing depending on the quality of the shrimp or prawns. This was pretty fabulous and the best version of this I've tried and you can see how silky the rice flour skin is. The sauce he tells us is a mix of soy sauce, sugar, ginger and green onion. It is dessert time and we have a selection of all of the desserts. 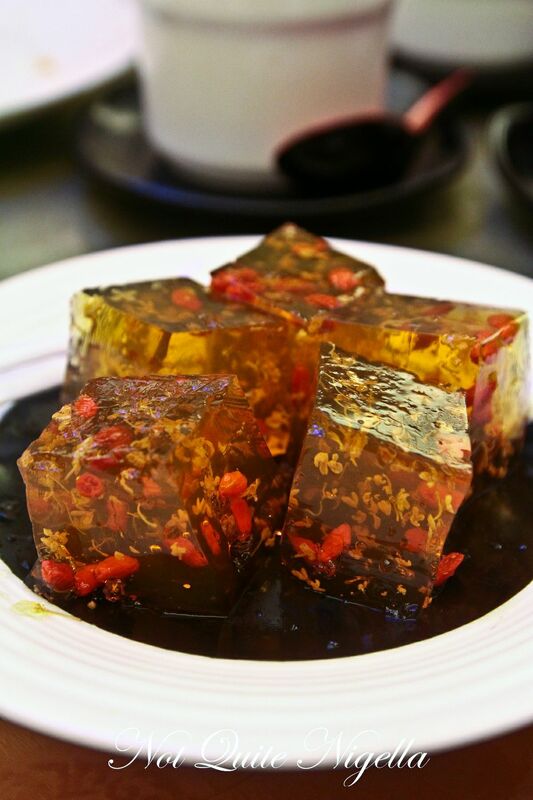 The wobbly cubes of jelly are hard to transport to the mouth but are worth it. They are cooling and sweet with little edible flower petals and goji berries inside. Bird's nest is a delicacy because it is the saliva that birds use to make their nests and is said to be good for the skin as it contains collagen. 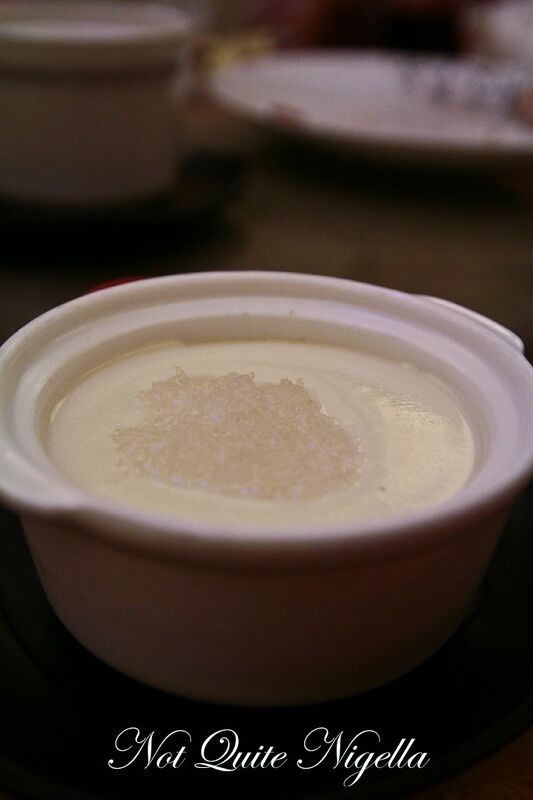 Here it is double boiled so that it is translucent and soft and it sits atop an egg white pudding flavoured with ginger. The texture is softly voluptuous. 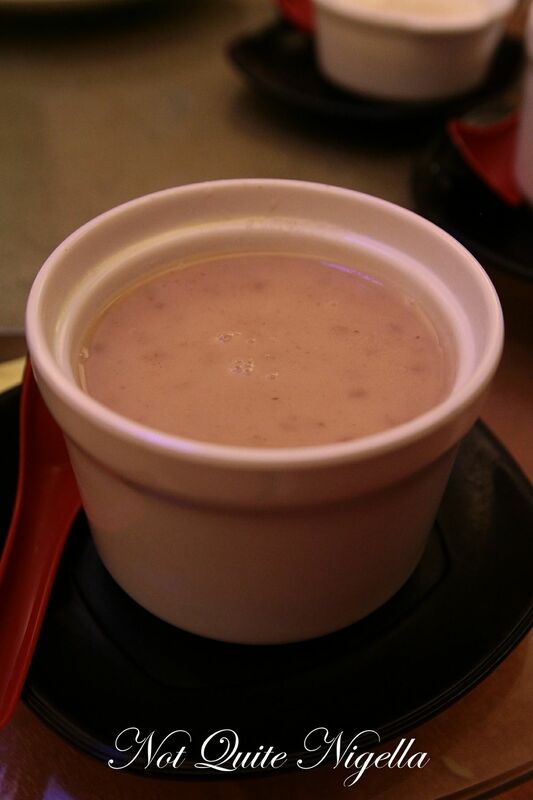 The sago cream with taro was Mirayana's favourite and has little pearls of sago in it. I usually like this a bit sweeter though. 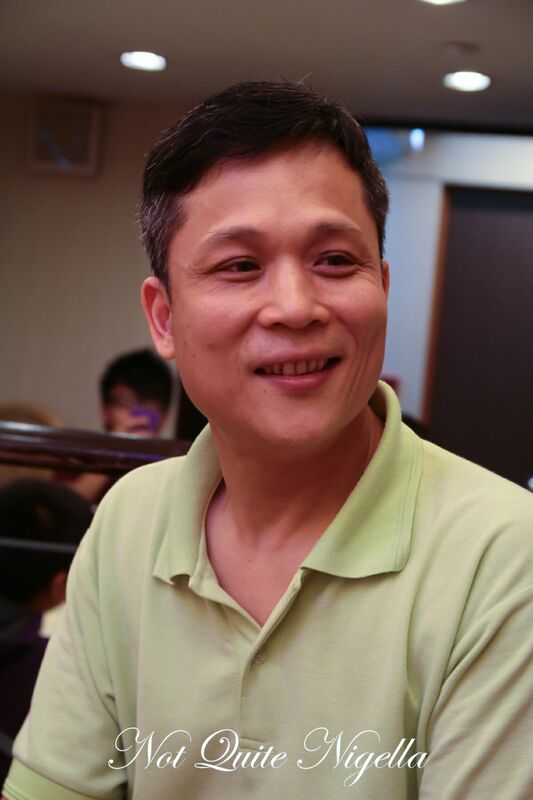 Chef Pui tell us that freshness of ingredients and making the dumplings close to serving time are his secret and he is also unfailingly modest and humble. Every morning at 5am at each of the branches (there are now three, with a fourth to come at North Point in June) they make all of the dumplings on the premises as Chef Pui doesn't believe in making them at a central point and then shipping them off as he believes that by the time that they got there, they would be not be fresh any more. To ensure that each branch retains the quality necessary he has two shareholders that visit each branch every day to monitor the quality of the items and every day Chef Pui tastes all of the items. The first two branches each sport a Michelin star. And how did he feel when he heard of his first Michelin star? He is animated and moves his hands rapidly to show extreme surprise. He was aware of the Michelin guide but never considered that one of his restaurants would be part of the hallowed guide. As a result, he tells us more that there are more tourists that visit and many come in clutching the guide. 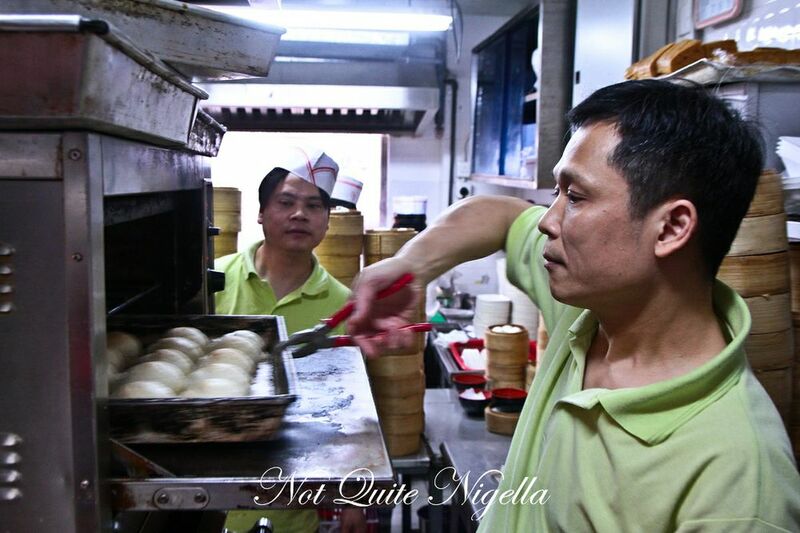 I ask him about the famous barbecued pork bun (which was so good that we had to have seconds of it) and he explains that unlike other baos which are steamed, these are baked and that he uses his knowledge as a chef to know how to modify things for taste easily. Every month he adds one or two items to the menu and there is also a special menu which incorporates items like roasted duck liver, escargot and bread pudding but these items must be ordered ahead of time. Which dumplings does he prefer? He likes the deep fried ones and we then ask him which other cuisine he enjoys after his first love which is Cantonese. He answers Vietnamese and he also enjoys Cantonese hot pots. And what of the future (yes I'm still not done trying to convince him to open up in Australia)? Surely the idea of franchising has crossed his mind as he has had offers to set up in Shanghai and Taiwan and that would be an easy way to retire early. He shakes his head firmly and smiles, "If I am not able to be there often, then the quality would suffer." 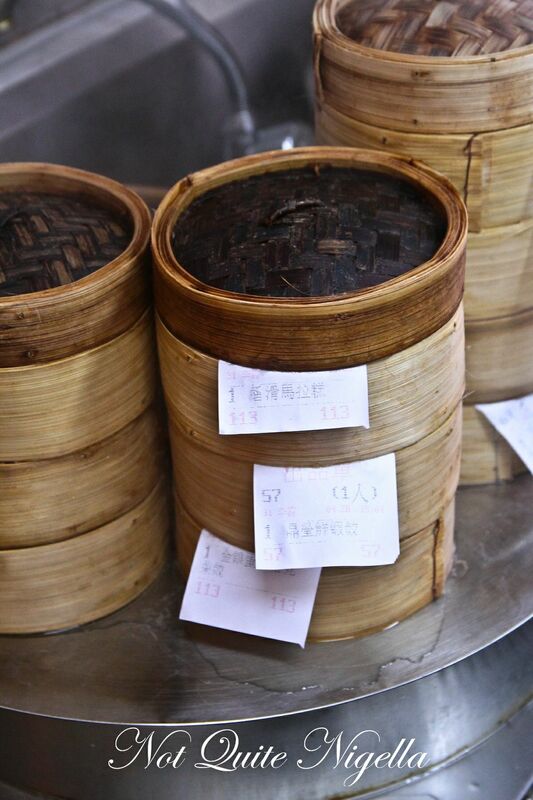 Meanwhile, we're all left to dream about the next time that we'll try the barbecued pork bun. 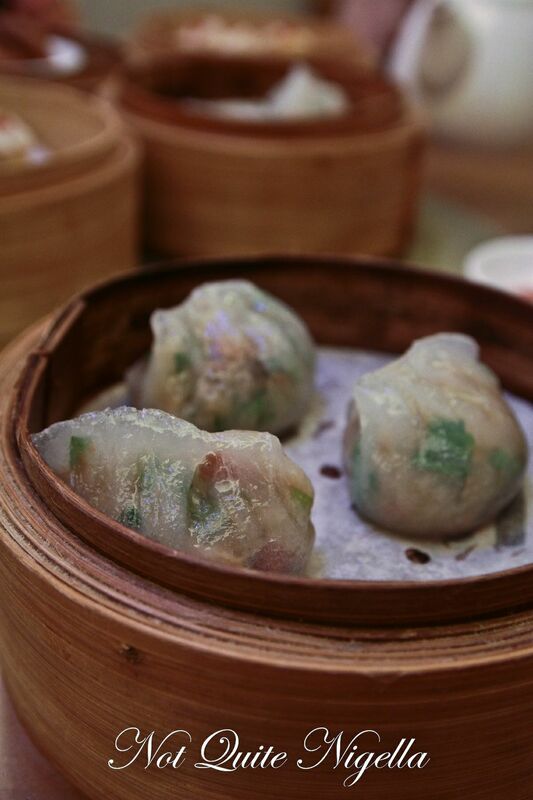 So tell me Dear Reader, which is your favourite yum cha/dim sum item and where is the best yum cha in your opinion? And do you ever use the Michelin guide when you travel? featureHow Much Can You Eat During Six Hours in Hong Kong? feature How Much Can You Eat During Six Hours in Hong Kong?